The 2016 Game Developers Conference is just a few months away, and today the folks putting it together are highlighting a cool new talk from Criterion Games producer James Svensson about what made the studio's Autolog system tick -- and why more developers should be studying it. 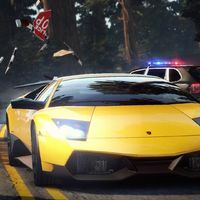 The Autolog social interaction system debuted in Criterion's 2010 hit Need for Speed: Hot Pursuit, winning critical acclaim for elegantly encouraging players to try and beat their friends' best times on individual in-game challenges. At GDC 2016, Svensson -- who helped create Autolog -- will look back on how the innovative system was developed in "Beat It. A Retrospective of Need for Speed: Hot Pursuit." Check out his talk -- which spans both the Design and Production tracks of talks at the March conference -- to learn how Autolog mechanics worked to keep Hot Pursuit players competing, how it helped pave the way for asynchronous but connected gameplay, and what inspirations and lessons learned you can take away to apply to your own projects. And of course, more great sessions will be announced for GDC 2016 in the coming months. Stay tuned, and don't miss the opportunity to save money by registering for the conference early -- the deadline to register for passes at a discounted rate is Wednesday, February 3rd, 2016.